The purpose behind the Old Girls' Union is to maintain links between those who have a shared experience of once being a pupil at Wolverhampton Girls' High School. Members ages span decades of the school's history but all retain the mark of their schooling. Whether you love it or hate it at the time you are a pupil it seems that within a decade you begin to recognise the effect the school had on you and usually ex-pupils recognise that their study skills and sense of hard work and fair play owe a lot to having been a Girls' High Girl! Membership of WGHSOGU is not expensive. The Alumni Association is not profit making and those of us that work for it do so without renumeration. The best way to think of it is a charitable donation that gives you the perk of being a fully paid up member of a prestigious school's alumni association - the Old Girls' Union! Funds raised from membership receipts and donations go towards funding school prizes and helping out students in need. The OGU also responds to charitable requests from outside the WGHS community. The annual subscription to the Old Girls Union is £3 or £35 for life membership. Subscriptions run from 1st September to 31st August in conjunction with the school year. Life members get all of the same benefits as members that pay annually. Fully paid up members receive an annual Newsletter and an invitation to the Old Girls' Supper. They are also contacted if anything happens at school that the body of alumni can participate in. 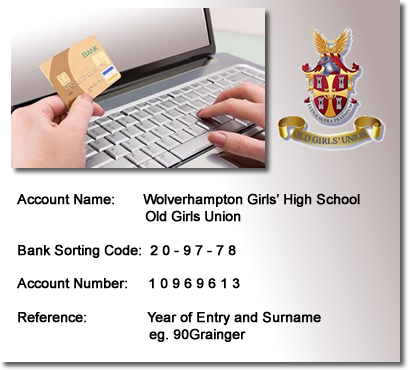 Cheques payable to 'Wolverhampton Girls' High School OGU' can be sent to the treasurer of the Old Girls' Union via the school. Please send all of the pertinent information with the cheque. Here is a pdf form you can print out, fill in and enclose with your cheque to ensire you don't forget anything. Here is a link to the online contact form to apply for membership. It asks you for all of the details we need to identify you within the Old Girls cohort. When you click 'send' it will be sent through to the treasurer and she has all of the information she needs to deal with your membership query. The graphic on the right gives you the banking details you will need to send a payment to us via the banking system. Please fill in a reference when you send your payment through the banking system. That will then appear on our statement and the treasurer will then be able to match up your application with the online payment you have made. The reference should be the year you entered WGHS followed by your Surname while at school. For example a payment to us from Hermione Grainger, who started secondary school in September 1990 would have the reference 90Grainger. The Treasurer could then sift through the email applications and see that Hermione had paid.